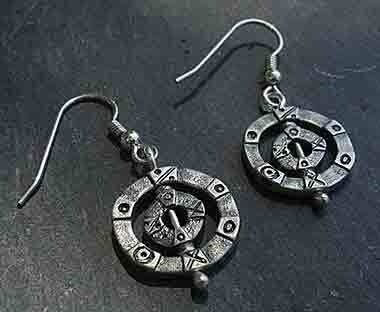 CELTIC EARRINGS : SCOTTISH Made : LOVE2HAVE in the UK! The BEST! Quality British handmade stud, hoop and drop Celtic earrings all handmade in the UK at prices you can afford. Most of the Celtic jewellery that you may come across is usually quite lightweight and made from cheap silver. What's more, is that much of this low-quality Celtic jewellery is made abroad in far away places and produced using cheap labour, designed and made by people who have probably never even heard of the word Celtic before, let alone visited our Celtic nations. We have ensured that our customers get the best Celtic earrings to buy online. Not only have we decided to feature the most unusual or alternative in designs, but the most authentic too. The earrings in this section are all painstakingly made by hand from a Scottish designer based in Orkney, a land famous for its Viking ancestry and also Celtic history. We would just describe the earrings here as stunning in their attention to detail and excellent quality. They are not the usual Celtic traditional styles that you come across but have a far more designer look to them that can be worn not only for special occasions but everyday wear also. The choices include drop and stud earrings, so we have something here for everyone. To top off all of these virtues most of them are available as matching Celtic jewellery sets and you will find the silver Celtic bracelets and Scottish Celtic necklaces sections on our website too.